British fourth seed Oliver Golding crashed out of the French Open juniors after being beaten by Amercan Bjorn Fratangelo for the second time in two weeks. In the clay of Milan during the Trofeo Bonfiglio, Golding had been smashed 6-2, 6-0 and in Paris the outcome was to the same degree going down 6-1, 6-1 in just 47 minutes. Not only did Golding lose in singles but he’s out of Roland Garros completely after his run in the doubles also came to an end when himself and Jiri Vesely were beaten in their quarter-final match. There was some good news for Golding later though when it was announced he had been given a wildcard for the grass court tournament in Queen’s next week. 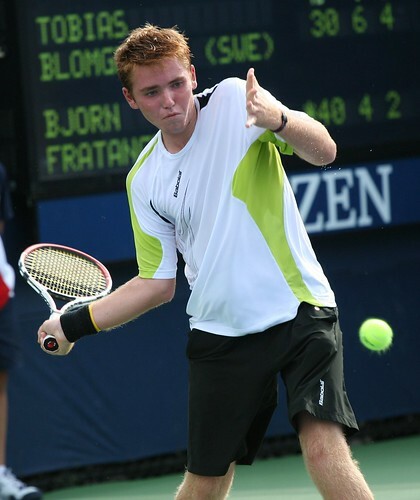 Another young American, Ryan Harrison, was also one of the four wildcards. For Fratangelo, named after clay-court specialist Bjorn Borg, it’s been a fruitful couple of weeks on the red dirt having reached the quarter-finals of the Trofeo Bonfiglio and now his first Grand Slam semi-final. The 17-year-old has a great chance of making the final too but seeing off home talent Tristan Lamasine could be a tough task. Lamasine beat German Robert Kern in straights but it was less than straightforward with the wildcard saving three set points in a second set tiebreak before winning it 8-6. In the other half of the draw, Dominic Thiem became the only surviving seed in the boys’ singles. The 14th seed beat Spain’s Oriol Roca Batalla 6-3, 6-2 and will play Mate Delic who beat another wildcard quarter-finalist in the form of Miki Jankovic. After five days which saw the the top five seeds progressing in the girls’ singles a shock was finally provided. Top seed Daria Gavrilova played came out worse in a three set encounter with Tunisian Ons Jabeur. Jabeur now has the chance of making history as the first Tunisian to win a Grand Slam title. She came close last year, finishing as runner-up and will now have the tricky task of beating Caroline Garcia if she’s going to at least match that. The number three seed came through her match with Yulia Putintseva comfortably and made a change from her tight struggles having almost gone out of the tournament in round two after being match point down. Putintseva and Gavrilova had been two of three Russians in the last eight but only one made it to the semi-finals and she looks unstoppable. Irina Khromacheva, Trofeo Bonfiglio winner two weeks ago and unbeaten since mid-March has yet to drop a set in the French Open juniors this year and dispatched of Anett Kontaveit 6-4, 6-1. At #520 on the WTA rankings the recently turned 16-year-old is already looking like a future star and next to face that imperialistic form is Monica Puig. The fifth seeded Puerto Rican’s potential classic with fourth seed Natalija Kostic didn’t pan out that way and she came though in comprehensive fashion finishing with a 6-1, 6-3 scoreline. At #314 in the world rankings of the WTA tour, the semi-final between Puig and Khromacheva could be the showcase of women’s tennis’ next generation. All the boys’ doubles and girls’ doubles news is also available via the Roland Garros website. If you thought the women’s singles were full of shocks at the French Open then take a look at the boys’ event which just keeps on giving. Despite starting with 18 of the world’s top 20 four days ago there are only two left. Three of the top 10 boys juniors were knocked out on Day 4 including this year’s Trofeo Bonfiglio winner Filip Horansky. The Slovakian third seed lost to Austria’s Dominic Thiem 6-4, 6-1 and Thiem is now the second highest seed left in the tournament as number 14. Joao Pedro Sorgi (10) joined Tiago Fernandes (6), Thiago Moura Monteiro (13) and Bruno Sant’anna (16) through the exit doors in a disappointing tournament for Brazil as all of their seeded players were dumped out before the quarter-final stage. Sorgi was trounced 6-1, 6-1 by Spaniard Oriol Roca Batalla who will now face Thiem for a semi-final berth. There was mixed fortunes for America as Bjorn Fratangelo beat Belgian Joris De Loore in two tiebreak sets but Oliver Golding of Great Britain also defeated Marcos Giron in the only three set match of the day. 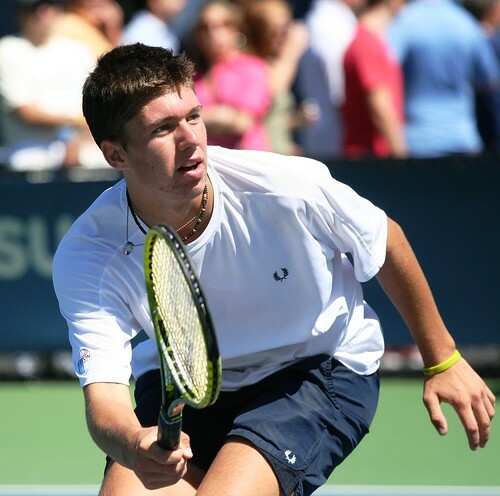 As fourth seed, Golding can now be considered favourite to win the French Open juniors but will now play Fratangelo in a re-match of the Trofeo Bonfiglio quarter-final in Milan where the American destroyed the world number four 6-2, 6-0. Also through was Germany’s Robert Kern and Tristan Lamasine won the all-French affair between himself and Laurent Lokoli to join Day 3 third round winners Miki Jankovic and Mate Delic. The quarter-final line-up in the girls’ singles is laced with quality with the top five seeds all in the frame for a semi-final place. It was close to being the top six seeds but Anett Kontaveit’s win over Danka Kovinic meant the Estonian became the only unseeded player in the last eight. The 15-year-old will now play second seed Irina Khromacheva (2), who is on a run of 29 matches without defeat stretching back to mid-March and lasting through junior and ITF events. An intriguing tie is Monica Puig (5) vs. Natalija Kostic (4) after both came through in three sets while Yulia Putintseva (7) against Caroline Garcia (3) is also set to be a high-quality match. Oliver Golding has also reached the quarter-finals of the boys’ doubles alongside Jiri Vesely and all the boys’ and girls’ doubles line-ups are available via the Roland Garros website. The final line-ups of the 52nd edition of the Trofeo Bonfiglio have been decided with the girls’ singles contestants consisting of the winning doubles duo. Irina Khromacheva and her partner Danka Kovinic beat Japanese pair Miho Kowase and Miyu Kato to claim the doubles crown in Milan and will now battle each other in Sunday’s final. Kovinic, seeded sixth in the girls’ singles, ended the spirited run of Iva Mekovec who came through qualification as a rank outsider. The Croatian had seen off much higher ranked opponents such as Montserrat Gonzalez and Sofiya Kovalets but finally came undone against Montenegro’s Kovinic. Despite exchanging breaks of serve in the early games, 17-year-old Kovinic came through the first set 6-3 before an understandably weary-looking Mekovec found herself 4-0* down in the second. She broke back but couldn’t stop the rot as Kovinic won the match 6-3, 6-1. Top seed and former junior world number one Khromacheva didn’t find it as comfortable but still came through with little trouble against Natalija Kostic. The 16-year-old Russian has been in imperious form in recent weeks, having won two $10,000 ITF events as well as two Grade 1 junior tournaments. In last month’s Open International Juniors de Beaulieu sur Mer she defeated Serbian third seed Kostic in the final. She only dropped four games in that match and it looked like she could beat that after the first set of the Trofeo Bonfiglio semi-final, taking it 6-1. However the second set was tighter and at 5-5 Khromacheva broke seeing out the match 6-1, 7-5 and extending her run to 25 consecutive wins. The number one seed didn’t survive in the boys’ singles though as Austrian Patrick Ofner beat Hugo Dellien 6-3, 6-4. Ofner had previously only won one Grade A match in his career but Bolivian Dellien made 30 unforced errors in the semi-final which culminated in the 18-year-old’s victory. His opponent in the final will be Filip Horansky. The Slovakian is ranked 10th in the junior rankings and beat the man two places below him Joao Pedro Sorgi. Brazil’s Sorgi, who beat second seed Dominic Thiem in the last round, is of Italian descent so the home crowd can’t even clutch at straws now after his 7-5, 6-2 defeat. Horansky claimed a first Grade A final berth after two semi-final appearances previously. Oh and just in case you were wondering, British pair Liam Broady and Oliver Golding won the boys’ doubles 6-3, 7-6 (8-6) against America’s Mitchell Krueger and Shane Vinsant. Semi-final highlights of Mekovec vs. Kovinic and Dellien vs. Ofner are available via La Gazzetta dello Sport’s website. The quarter-final line-ups have been decided in both the boys’ and girls’ events and the competition is certainly hotting up. Two big-name casualties fell in the third round of the boys’ draw. Australian fifth seed Andrew Whittington lost in three sets to Brazil’s Thiago Moura Monteiro with the third going all the way to a tiebreak which the eleventh seed won 7-3. Even more shocking was Oliver Golding’s exit. 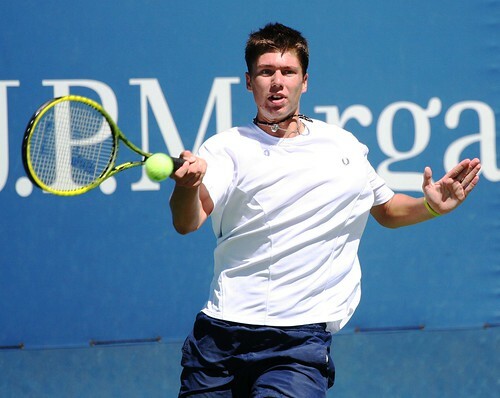 American Bjorn Fratangelo had already knocked out sixteenth seed Mate Delic and dispatched of the British third seed in clinical fashion winning 6-2, 6-0. His response on Twitter read: “Hmm … No words to describe that really.” So I guess we’ll move on. Today Dominic Thiem (2) will face Joao Pedro Sorgi (8) in an intriguing match-up while the latter’s Brazilian compatriot Monteiro gets top seed Hugo Dellien as a reward for his win. Wins for Mate Pavic (4), Filip Horansky (7) and Patrick Ofner completed the last eight. The shocks continued for the girls in Milan. Iva Mekovec is making a mockery of her severely low ranking after beating Ukrainian ninth seed Sofiya Kovalets 6-4, 6-0. Mekovec looks unstoppable right now and will be a huge threat to fourth seed Montserrat Gonzalez who had to win a last set tiebreak 7-2 to stop another Brazilian progressing in Beatriz Haddad Maia. Another surprise loss was Anna Karolina Schmiedlova. The Slovakian tenth seed fell to Russian Elizaveta Kulichova who will now face Natalija Kostic (3) following her three sets win over Ilona Kremen (14). The solitary Italian Stefanelli couldn’t her home crowd with local interest as Ganna Poznikhirenko (8) edged a first set tiebreak before seeing out the match. Irina Khromacheva (1) won comfortably against Anett Kontaveit (15) to face the Ukrainian eighth seed. Elsewhere Danka Kovinic (6) prevailed over Jovana Jaksic (11) and Petra Rohanova defeated Marianna Zakarlyuk’s decent run. For all the four racket lowdown, checkout the boys’ doubles and girls’ doubles semi-final line-ups and quarter-final scores. After an unpredictable couple of days, it was back to business for the top seeded boys and girls at the Trofeo Bonfiglio as the third round line-ups were completed. The only player of real shock to be in the girls’ last 16 is Brazilian qualifier Beatriz Haddad Maia who overcame Zarah Razafimahatratra, the Madagascan 16th seed, in round two. Haddad Maia’s 15th birthday is coming up at the end of the month and at 177 on the junior rankings she could be challenging the top junior players on a regular basis soon enough. Another qualifier revelling in tournament success is Iva Mekovec. The 16-year-old Croatian is ranked well outside the top 300 on the junior circuit but after reaching the quarter-finals of an $10,000 ITF event last month, only ninth seed Sofiya Kovalets stands in her way of another last eight spot. Three all-seeded affairs are taking place today with Irina Khromacheva (1) vs. Anett Kontaveit (15), Natalija Kostic (3) vs. Ilona Kremen (14) and Danka Kovinic (6) vs. Jovana Jaksic (11) after all six won in straight sets. After losing the first set to love, the home crowd’s attention will be on qualifier Lorenza Stefanelli as she is the only Italian left in either boys or girls draws after eventually coming through her second round match against Viktoriya Tomova 0-6, 6-2, 6-2. That will tell you Antonio Campo failed to win his match in the boys’ event but he put up a spirited display against third seed Oliver Golding with the Brit eventually winning 6-3, 6-7 (6-8), 6-2. Stefano Napolitano and Mikhail Vaks had caused upsets in the first round but neither made it to the third, Vladyslav Manafov and Filip Peliwo coming out on top. Top seed Hugo Dellien made it through despite dropping the first set while second seed Dominic Thiem enjoyed a more comfortable 6-2, 6-3 win. To see all the boys’ singles and girls’ singles scores, results and matches then the ITF website has a rundown of the entire second round. The seeds continued to drop on Day 2 of the Trofeo Bonfiglio with Brazilian Bruno Sant’anna, in particular, having a tournament to forget. Not only did he lose his doubles match alongside compatriot Thiago Moura Monteiro but the tenth seed and junior world number 14 also crashed out of the first round in the singles draw, losing 6-1, 6-1 to Russian qualifier Mikhail Vaks. Shane Vinsant (14) lost to Belarus’ Yaraslau Shyla and that proved to be the last shock of the first round results but as those were being completed some second round matches provided further big-name defeats. On Day 1 it was the Italians who crushed the seeds but Americans Alexios Halebian and Bjorn Fratangelo were the giant killers this time. Ninth seed Luke Saville of Australia succumbed to Halebian 6-1, 6-4 whilst Fratangelo beat Croatian Mate Delic 7-5, 6-2. In the latter match Delic had been given the lowest seeding of sixteen but with Frantangelo sat one place below him in the rankings it wasn’t a huge upset. German Robin Kern also knocked out Nikola Milojevic (15) but Mate Pavic (4), Andrew Whittington (5), Filip Horansky (7) and Joao Pedro Sorgi (8) all made it to the third round. Unfortunately for the home crowd Gianluigi Quinzi couldn’t replicate his first round heroics as he fell to Patrick Ofner. Oliver Golding will take on Antonio Campo, one of two remaining Italian players in the boys’ event today looking to avenge his British companions’ defeats on Monday. Top seeds Hugo Dellien and Dominic Thiem are also in second round action later. In the girls’ draw the biggest surprise was seventh seed Victoria Bosio’s second round defeat. The 16-year-old Argentine lost 6-3, 6-4 to Russian Elizaveta Kulichkova. Czech twelfth seed Jesika Maleckova fell to Bulgarian Viktoriya Tomova in the first round but elsewhere most of the top seeds won their second round matches with relative ease. Eugenie Bouchard and Chantal Skamlova will want to leave Milan sharply after the pair lost out in the doubles to coincide with both their first round defeats. Looking for someone I missed? The drawsheets for the boys’ singles and girls’ singles are still available and updated everyday via the Tennis Club Milano Alberto Bonacossa website as well as the boys’ doubles and girls’ doubles events.